A short break in one of the many splendid Eastern European capital cities may not have been your top choice but, when you realise how much they have to offer for such a great price, that may change! . The City Costs Barometer 2016 put together by the Post Office shows that 8 out of the top ten destinations for the cheapest city break in Europe are in the east of the continent. This annual ranking list is based on the cost of a two-night stay in a three-star accommodation, also taking into consideration the costs of various activities you might incur during your stay such as food and sightseeing. The leading three cities on the list are Warsaw, Vilnius and Budapest. The cheapest destination, Warsaw, is priced at a cost of just £113.22 for the weekend. The only two western cities to get into the top ten are Lisbon and Athens - with Lisbon the cheapest of the two at £134.75. Of all the cities on the list, Stockholm was the most expensive at £325.44 for the weekend. Warsaw is a tempting mix of architecture with gothic buildings nestled up against concrete structures from the communist era and modern glass and steel structures. This fabulous city has had one of the most horrific histories, almost completely destroyed during WW2, there are now many monuments and museums, such as the Warsaw Rising museum, which recognize this period in the city's history. The Palace of Culture and Science, built in the 1950’s was a 'gift of friendship' from the Soviet Union. It is the tallest building in Poland and houses theatres, a cinema and museums. There is also an observation deck where you can look out across this stunning city with its many beautiful parks and gardens. You can hire a car in Warsaw for just £55.33 for the weekend.With your hire car you could travel to Auschwitz to the south of Warsaw and visit the Auschwitz-Birkenau museum and memorial to those who perished in the camps. Vilnius has a village feel with its cobbled streets, many little churches and traditional artists' workshops, however, the surrounding cathedrals and palaces reveal a rather grander aspect. The Museum of Genocide Victims, situated in the former KGB headquarters, is a reminder of the city's more troubled past. The Antakalnis Cemetery is one of Europe's most poignant burial sites set in a magnificent location. Here you will find the graves of those killed in many different wars - from the 1990's back to the Napoleonic era. A hire car from just £42.86 for the weekend will enable you to travel to the magnificent Trakai castle on Galve lake just 25km away from Vilnius. 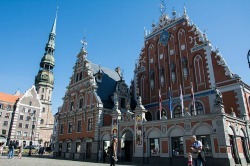 Another Eastern city high on the list is Riga, the largest of the 3 Baltic capitals and once the biggest city in the Swedish empire. A hire car from the airport can cost you as little as £38.63 for the weekend and will enable you to get to the sea resort of Jurmala just a short drive away. One of the most popular attractions in Riga is Alberta Iela, a street with architecture which will captivate you for hours! There are all kinds of curiosities on the buildings to grab your attention including goblins, snakes, lions and peacocks. Riga's central market is brimming with food stalls and the Art Museum Riga Bourse, located in the old stock exchange, has many treasures including a Monet. So check out these stunning cities and see what you can discover. You may be surprised!